Dr. Lewis E. Kay received his B.Sc. in biochemistry from University of Alberta in 1983 and his Ph.D. in molecular biophysics from Yale University in 1988. After working at the National Institute of Health as postdoctoral fellow until 1991, he joined the Department of Biochemistry of University of Toronto. He was assistant professor from 1992 to 1994 and was subsequently appointed full professor of molecular genetics, biochemistry and chemistry. Dr. Kay is currently one of the leading pioneers of biomolecular solution NMR. His international stature and the caliber of his reputation are by far second-to-none as gauged by any academic and scholarly standard and by all possible research output metrics. To date, Dr. Kay has published over 400 papers and he earned more than 37,000 cumulative citations with an h-index in excess of 100. Each of these publications is an impressive piece of art, which is truly inspiring both in terms of general vision and of experimental and analytical approaches. 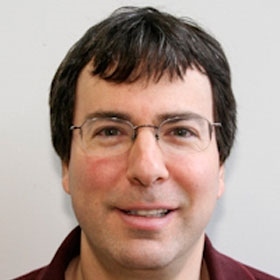 Dr. Kay sustains an impressive and unparalleled steady stream of very high impact papers (Nature, Science, PNAS, JACS) and he is a very sought-after keynote speaker at essential all international NMR and structural biology meetings. In recognition of his stature and the impact of his contributions, Dr. Kay has received numerous very well deserved awards, including the “Top 40 Under 40” distinction, the HHMI membership, the Founders Medal of the International Conference on Magnetic Resonance in Biological Systems, the Laukien Prize of the Experimental NMR Conference, the Premiers Discovery Award for Life Sciences and Medicine from the Government of Ontario, the election to Fellow of the Canadian and British Royal Societies, the Khorana 2012 Prize, the promotion to University Professor and the NSERC E.W.R. Steacie Memorial 2013 Fellowship. Dr. Kay has been a tremendously beneficial intellectual beacon for Canada. This is not only because of his pioneering contributions to science, but also because of his outstanding training skills. Dr. Kay has trained in his lab a new generation of leaders in NMR, who now hold key academic positions in North America, Europe and Asia. This impressive accomplishment is the result of both the inspiration Dr. Kay has offered to young researchers world-wide and the daily laboratory practice of Dr. Kay, who works very closely with his trainees at all stages of the scientific process. In addition, Dr. Kay has been immensely generous and supportive with the rest of the biophysical community in Canada and world-wide in many ways and forms, from sharing expertise and pulse sequences to providing expert advice on new projects and career choices.